Quinnipiac’s Gillian Abshire tries to steal the ball away from a Mount St. Mary’s player Monday night. 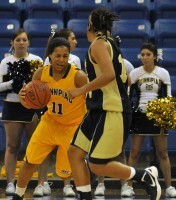 Quinnipiac’s Samantha Guastella controls the ball in the first half of Monday’s game vs. Mount St. Mary’s. 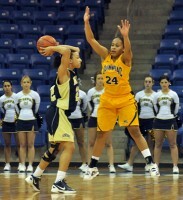 Quinnipiac’s Jasmine Martin drives upcourt in the first half of Monday’s game vs. Mount St. Mary’s. Quinnipiac’s Gillian Abshire reaches for the ball in the second half of Monday’s game vs. Mount St. Mary’s. 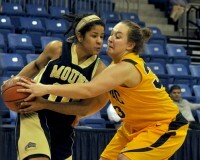 Quinnipiac’s Jasmine Martin guards a Mount St. Mary’s player in the second half of Monday’s game. Quinnipiac’s Brittany McQuain goes for a layup in the second half of Monday’s game vs. Mount St. Mary’s. 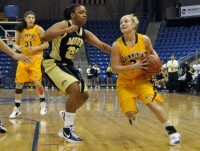 Quinnipiac’s Lisa Lebak drives to the hoop in the second half of Monday’s game vs. Mount St. Mary’s. Quinnipiac’s Shaina Earle dribbles the ball in the second half of Monday’s game vs. Mount St. Mary’s. Quinnipiac’s Samantha Guastella goes for a layup in the second half of Monday’s game vs. Mount St. Mary’s.